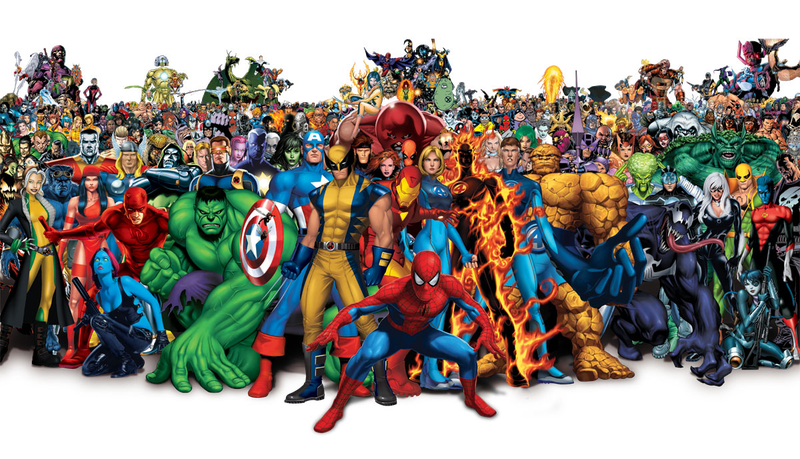 Ever wondered which Marvel characters are the most popular among comic book fans? Well, it looks like Comic Book Resources did a rather comprehensive and sophisticated poll on the subject back in February, the results of which were posted last month. Looking through it, some of the top contenders are pretty obvious, but others are more than a little surprising. Two things should be mentioned first before I continue. First of all, the poll was based exclusively on the characters' comic book appearances, at least in principle. It's hard to imagine the film and TV versions of characters had no effect at all on the results, but they weren't the primary factor at least. Secondly, the poll was conducted by asking each poster to list their top 10 characters, rather than asking them to vote for one in particular. The character they ranked #1 scored the most points, the character they ranked #10 scored the least points. First of all, let's talk about some of the characters who didn't make the top 100 (but were counted). Most of these weren't very surprising, minor characters who've only been in a couple of storylines, as well as a huge slew of alternate universe characters like the Ultimate line. A few of the biggest upsets were the Red Skull, J. Jonah Jameson, Gwen Stacy, Ultron, and Nick Fury (both versions). I was also pretty surprised, given all the fuss about the Mandarin in Iron Man 3 that he didn't score high enough to make the list. Assuming this poll is accurate, I think it's fair to say then that the complainers were a vocal minority. Moving on to the characters that actually made it to the top 100, some real surprises begin to emerge. First of all, the Fantastic Four, Marvel's "first family" and the first major co-creation between Stan Lee and Jack Kirby, are surprisingly unpopular. The Human Torch, who was something of Marvel's mascot for awhile, barely made into the list at all, tying with the supervillain Apocalypse for 100th place. Mr. Fantastic and Invisible Woman did better, ranking #65 and #51 respectively, but it's still a poor showing for the team. The Thing proved the most popular character of the bunch, placing at #31 and scoring the most individual votes of any character (but ranking #1 on no one's list). One has to wonder how this bodes for Fox's upcoming reboot of the team. There were some other upsets. Flash Thompson's Agent Venom (#64) is more popular than Eddie Brock's original Venom (#78). Miles Morales is tied with Norman Osborn (both #91) and significantly more popular than the Ultimate version of Peter Parker (who failed to make the list). Gwen Stacy didn't make the list, but Mary Jane Watson (#73) did, proving herself the most popular "civilian" character in the Marvel universe. Thanos (#47) is waaaay more popular than Galactus (#92), even though I'd never heard of the former until The Avengers came out. And the Guardians of the Galaxy really are bit players - only Rocket Raccoon (#91) and (#75) made the list at all, making the team significantly less popular than Namor (#35), Captain Britain (#28), or Dr. Strange (#27). Moving on to the top 25, I was surprised by some but not all of the results. The MCU's biggest earner, Iron Man (#20), was ranked below the franchise's lowest earner, the Hulk (#18). Carol Danvers is Marvel's most popular solo female character, ranking at #15. Magneto (#11) is Marvel's most popular villain, followed by Dr. Doom (#19). And, perhaps to no one's great surprise, the fandom's ultimate favorite is Earth-616's Peter Parker, the Amazing Spider-Man. Looking at the list and considering what relevance, if any, this has for future movie adaptations, a few things occurred to me. People really like the X-Men, whose ranks made up 14 of the top 25 characters (Scarlet Witch and Magneto included). That bodes well for Fox, since it looks like they're in no danger of running out of characters people will show up to see. However, Fox's other superhero franchise, the Fantastic Four, may come with more baggage than expected. In Sony's case, they're in a bit of a pickle. While Spider-Man himself is extremely popular, none of the other characters from his corner of the Marvel universe broke the top 50. Spidey's most popular villain, Otto Octavius, was ranked down at #59. And none of Parker's friends and family ranked outside of Mary Jane. This raises the question as to how "expandable" Spider-Man's universe really is. Lastly, if Marvel's looking for a female character to launch solo in the MCU, Carol Danvers is the one to pick. She's powerful, she has a long-running solo title, and she's (according to this poll) very popular. That isn't to say Black Widow (#22) doesn't deserve a shot as well; she absolutely does and if Marvel can run several male superheroes at once they can certainly run more than one female-led franchise. But if the poll's results are to be believed, Danvers is actually more popular among comic book fans than any other Avenger besides Captain America (#9) and Thor (#5). So those are my thoughts. What do you guys think? Did any of you catch a glimpse at this poll before now? Did of any you actually vote? EDIT: For reasons which I am not aware of, the thread appears to be down. It's possible this is an error or standard procedure by Comic Book Resources. Whatever the case, I've altered the original link to direct to a cached archive of the thread's front page within Google's database.